Weddings in Winter can always be a little bit of a minefield. Weather obviously always plays havoc with most plans and there are so many things to bear in mind when planning or deciding on having a wedding in the Winter – not only do all the colour schemes have to change (orange and yellow look a little odd when everything’s so grey around) Photos are harder to take as no-one wants to be clambering around in the mud or the freezing cold let alone posing for them, the reception area has to be picked careful – no outdoor soiree and the wedding favours are more than likely going to be a rug than anything else but the one thing that worries us here at HQ is keeping the bride warm enough! This J by Jasper Conran at Debenhams Jewelled stole has a real antique, vintage feel to it and is super delicate with its fluffy texture and is priced at £48.74 Team this with our stunning ‘Pink and Cream Chloe Roses and Crystal’ bouquet for a stunning, feminine look. This Debut at Debenhams Ivory cape has a higher collar in order to keep out those Wintry gusts, in traditional Ivory, priced at only £31.50. 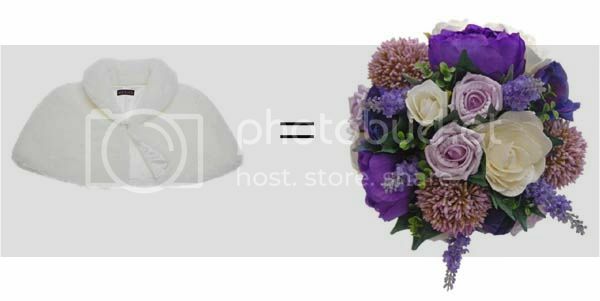 Make for a delicate and earthy feel when teamed with our Purple, Lilac and Ivory flower bouquet. The Lilac and ivory colour scheme is fresh without being summery and with the green fiscus foliage helps keep it natural and earthy. We here at HQ, adore this intricate and very Festive looking Lace Cornelli embroidered trim jacket from John Lewis. Priced at £105 it’s a little more expensive but it will keep you warm whilst still looking amazing. Team with our Burgundy, Ivory and Pink bouquet to go all out and festive. All you need now is a light dusting of snow! A scalloped hem cape from Phase Eight is a joy to look at – with beautiful embellishment is littered with beads and sequins. Priced at £99 This is so pretty there is no doubt you would want to wear this again and again! We’ve teamed this with our extra special Beaded bouquet that teams ivory roses with loops of small pearls and beaded butterflies. This entry was posted in Brides, Fashion and tagged artificial wedding flowers, beaded bouquet, Bouquet, Bride, Brides bouquet, Burgundy roses, cold, cream roses, Debenhams, fake, fake fur, faux, fuax, ivory cape, Jasket, Jasper Conran, Jewelled Stole, keep the bribe warm, Phase Eight, pink, sarahs flowers, sarahsflowers, silk flowers, Vintage, weather, wedding day flowers, wedding fashion, Wedding flowers, Winter, winter wedding.